The commoning community is diverse. 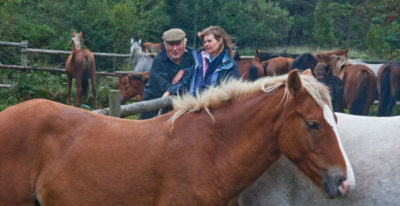 At its heart are several large families who have farmed in the New Forest for generations. Around them are many individuals who are equally committed to their animals and this special way of life. Modern commoning is a vocation, fitted around everyday life and subsidised by other income. You’ll find commoners working in organisations and businesses throughout the New Forest area, whether in public services like schools and colleges, care homes, hospitals, or in farming, professions and tourism. Caring for the animals that graze the Forest has to be fitted into these normal, busy lives. A poorly animal cannot wait to be caught and taken home when necessary, at any time of day or night, and it is part of the commoners’ responsibility to help each other with these essential, and often unpredictable, tasks. To have the right to be a commoner depends solely upon the “occupation” of a piece of land with common rights, regardless of whether this land is shared, rented or owned. Most land with rights is lost to commoning, often with the owners unaware of the rights, so the land that is still occupied by commoners is of great importance. Commoners often work together to catch their ponies, compete against one another in the annual pony races and gather together to sell their ponies at Beaulieu Road. Commoners like their animals are ‘haunted’ in their local area. The commoning community holds a wealth of knowledge about and passion for the New Forest. Commoning isn’t just about animals. It’s about people. It is about family, community, and New Forest skills. The cultural heritage of the New Forest lies much more in these people than it does in buildings or other physical features of the landscape. Commoning is a big family – falling out, making up and working together. At the end of the day there are more ups than downs but it’s a way of life. You appreciate the good times when they come. We have a responsibility to keep commoning going, to take care of the Forest and keep the old traditions alive. The commoning community is made up of families, many of whom have worked together for generations, with grandparents, parents, children, and grandchildren all commoning in their own right. There are many commoners who are new to commoning, but who have decided to become part of the real New Forest. It is certainly a challenging commitment, but it is also highly rewarding to be part of something so special, and upon which the future of the New Forest is dependent. You can find out more about the commoners in the report of the most recent commoning census, which is free to download and is packed with facts about commoners, their style of commoning, their motivations and concerns.